U.S. Army Lieutenant General (ret.) 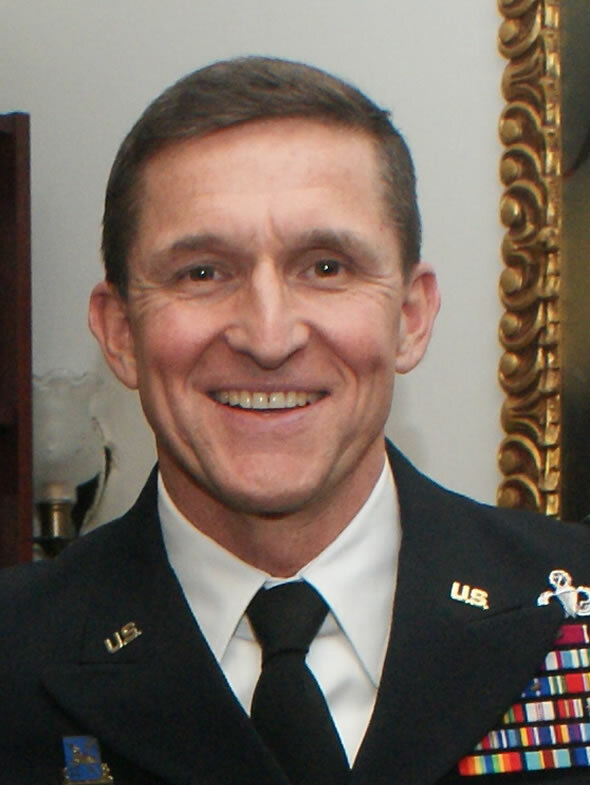 Michael Flynn was the first national security adviser in the Donald Trumpadministration.Prior to that, he had a storied military career, culminating in his posting as director of the Defense Intelligence Agency (DIA) from 2012 to 2014.Previously, Flynn was a senior intelligence officer for the International Security Assistance Force (ISAF), U.S. Central Command (CENTCOM), the Joint Staff, and Joint Special Operations Command (JSOC).After being relieved from his job at the DIA by President Barack Obama, Flynn became a far-right pundit, spreading conspiracy theories and targeting Muslims. In February 2017, after only a few weeks as Trump’s national security adviser, Flynn was fired after reports emerged that he had discussed Obama administration sanctions with the Russian ambassador and allegedly lied about those conversations with other Trump officials. Subsequently, numerous additional allegations emerged concerning possible connections between Flynn’s ties with Turkey and Russia and U.S. policy-making in the Trump campaign. Flynn was eventually subpoenaed to testify before Congress, an obligation he dodged until he reached a plea deal and the subpoena was dropped. The reported proximate cause of Flynn’s firing was that he had “misled” Trump and Vice President Mike Pence about his discussions with Russian diplomats about sanctions that the Obama administration had levelled against Russia. But Flynn was mired in scandal even before he took up his position, and became a lightning rod, drawing scrutiny on the entire Trump campaign and early administration. Mere days after Trump’s inauguration acting Attorney General Sally Yates met with White House counsel Don McGahn to warn him the Justice Department had evidence, via the FBI surveillance, that statements Pence was making publicly—that Flynn’s conversations with Russian diplomats had nothing to do with sanctions—were false. Four days later, Yates was fired. In November 2017 Flynn agreed to a plea deal in exchange for his cooperation with the investigation of Russian interference in the 2016 led by Robert Mueller.Flynn pled guilty to lying to FBI investigators about his conversations with the Russian ambassador, Sergey Kislyak. Flynn’s sentencing has been delayed several times, the last coming in July 2018. As of that date, it remained unclear what substantive help Flynn was giving the ongoing investigation. Regarding Russia, although Flynn at times warned about Moscow’s past behavior, while on the Trump team he stuck closely to Trump’s favorable attitude toward Russia, dismissing concerns over its invasion of Ukraine, bombing in Syria, and interference in U.S. elections. 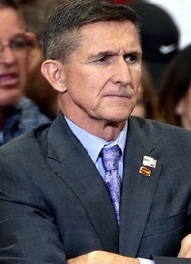 After leaving the DIA in August 2014, Flynn became involved in various business enterprises–including a drone business that could benefit from Trump border security plans—and served as a go-to political pundit on conservative media outlets like Fox News, where he was in the “vanguard of those criticizing” the Obama administration for being weak. Flynn’s tenure at the DIA lasted one year less than the customary three years DIA directors serve. “ He had stated that he has “not ruled out running for elected office at some point in the future,” although subsequent events have likely mooted any such plans. Flynn further claimed during his testimony: “Iran has every intention to build a nuclear weapon. They have stated it many times.” In fact, Iranian officials have consistently maintained that their nuclear program is for peaceful purposes only,and that U.S. intelligence agencies in 2007 and 2011 assessed that Tehran had abandoned its nuclear weapons program in 2003, and had likely never made a decision to actually acquire one should its capabilities ever develop that far. Flynn was an advisor to the anti-Iran deal group Veterans Against the Deal, which partnered with the American Security Initiative(ASI) to run TV ads opposing the deal in the run up to Congress’s September 17, 2015 deadline to vote on the agreement. ASI’s board includes avowedly militarist figures like former Sens. Norm Coleman(R-MN) and Joe Lieberman(I-CT). Flynn has lent credence to claims that the United States recognized in 2012, shortly after the start of the Syrian uprising, that much of the insurgent opposition in Syria was dominated by radical Islamist groups, pointing to a declassified DIA report stating that in August 2012 the U.S.-backed Syrian insurgency was mostly comprised of “the Salafists, the Muslim Brotherhood and al-Qaeda in Iraq.” Flynn said that the Obama administration made a “willful decision” to turn a “blind eye” to this. Jason Criss Howk, “Lieutenant General (Retired) Michael Flynn and the Iranian Nuclear,” Medium, September 8, 2015, https://medium.com/the-bridge/lieutenant-general-retired-michael-flynn-and-the-iranian-nuclear-agreement-f732535095dc. Sean Naylor, “Out of Uniform and Into the Political Fray,” Foreign Policy, June 19, 2015, http://foreignpolicy.com/2015/06/19/out-of-uniform-and-into-the-political-fray/. HASC Subcommittees, June 10, 2015, http://docs.house.gov/meetings/FA/FA13/20150610/103582/HHRG-114-FA13-Wstate-FlynnM-20150610.pdf. Shahram Chubin, “The Politics of Iran’s Nuclear Program,” The Iran Primer, http://iranprimer.usip.org/resource/politics-irans-nuclear-program. Matt Duss, “DoD Report: ‘Iran’s Ideological Goals Have Taken A Back Seat To Pragmatic Considerations,’” ThinkProgress, April 21, 2010,http://thinkprogress.org/security/2010/04/21/176017/dod-report-iran%E2%80%99s-ideological-goals-have-taken-a-back-seat-to-pragmatic-considerations/. Seymour Hersh, “Iran And the Bomb,” The New Yorker, June 6, 2011, http://www.newyorker.com/magazine/2011/06/06/iran-and-the-bomb-seymour-m-hersh. Aaron Bandler, “ACU’s Center for Statesmanship and Diplomacy Hosts Panel On Iran Nuclear Deal As Their First Event,” Townhall, June 20, 2015,http://townhall.com/tipsheet/aaronbandler/2015/06/20/acus-center-for-statesmanship-and-diplomacy-hosts-panel-on-iran-nuclear-deal-as-their-first-event-n2014809. Sandy Fitzgerald, “Gen. Flynn: Obama’s Middle East Policy One of ‘Willful Ignorance,’” Newsmax, March 29, 2015,http://www.newsmax.com/Newsfront/GenMichael-Flynn-Iran-nuclear-deal/2015/03/29/id/635140/. Nafeez Ahmed, “Officials: Islamic State arose from US support for al-Qaeda in Iraq,” Medium, August 13, 2015, https://medium.com/insurge-intelligence/officials-islamic-state-arose-from-us-support-for-al-qaeda-in-iraq-a37c9a60be4. Stephen Hayes, “Former Defense Intel Chief Blasts Obama,” The Weekly Standard, January 27, 2015, http://www.weeklystandard.com/blogs/former-defense-intel-chief-blasts-obama_826593.html?page=1. Kimberly Dozier, “Spy General Unloads on Obama’s ISIS War Plan,” The Daily Beast, January 27, 2015,http://www.thedailybeast.com/articles/2015/01/27/ex-pentagon-spy-chief-blasts-white-house-paralyzed-by-radical-islam.html.